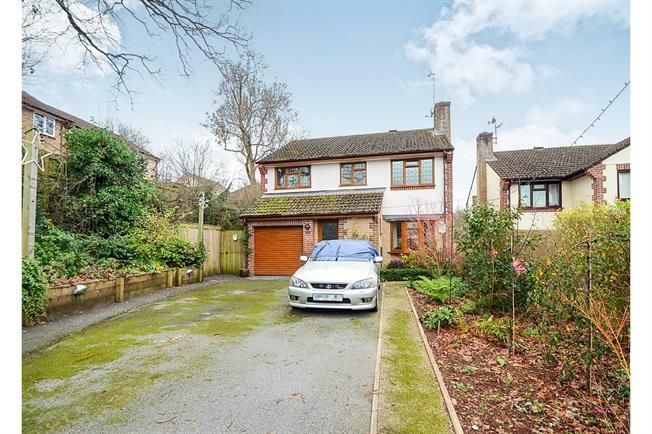 4 Bedroom Detached House For Sale in Newton Abbot for Offers in excess of £325,000. A fantastic detached family home in the highly sought after village of Ogwell, close to Canada Hill primary school. Comprising entrance hall, wc, lounge, dining room, kitchen and integral garage with utility area on the ground floor. On the first floor are four bedrooms, master en-suite and three with built in wardrobes and a family bathroom. Outside there is a driveway with parking for four cars and landscaped borders. To the rear is a landscaped garden with patio, deck, covered pergola, raised borders, potting, garden shed and decorative arbour. UPVC double glazed front door. Radiator, original coving. Double glazed uPVC window with obscure glass facing the side. Heated towel rail. Concealed cistern WC, vanity unit. UPVC sliding double glazed door opening onto the garden. Double glazed uPVC bay window facing the front. Radiator and living flame gas fire with fire surround, original coving. Double glazed uPVC window facing the rear overlooking the garden. Under stair storage cupboard. UPVC double glazed door opening onto the garden. Double glazed uPVC window facing the rear overlooking the garden. Composite granite work surface, fitted wall and base units, one and a half bowl sink, space for range cooker, stainless steel extractor. Tubelight window. Built-in storage cupboard with gas boiler. Double glazed uPVC window facing the front. Radiator, sliding door wardrobe. Double glazed uPVC window with obscure glass facing the front. Heated towel rail. Concealed cistern WC, double enclosure shower, semi-pedestal sink. Double glazed uPVC window facing the rear overlooking fields. Radiator. Double glazed uPVC window facing the rear overlooking fields. Radiator, a built-in wardrobe. Double glazed uPVC window with obscure glass facing the rear. Heated towel rail. Concealed cistern WC, panelled bath with shower over, inset sink. UPVC double glazed door opening onto the garden. Double glazed uPVC window with obscure glass facing the side. Metal remote roller door. Utility area with work surface, fitted wall and base units, one and a half bowl sink, space for electrical appliances. Driveway with parking for 4 cars. Landscaped borders to either side. Covered bin store. Gates to either side giving access to the rear garden. The rear garden has been landscaped with patio decked areas covered pergola raised beds, potting shed, garden shed and decorative arbour.